Command armies of fantastic creatures, cast spells of devastating power, and summon relics of ancient renown to defeat opponents in Pox Nora! Where collectible cards meets tactical strategy, gamers will find endless ways to combine over 1500 champions, 500 spells, and 400 relics & equipment, on over 40 maps. Make no mistake - this game is massive, and massively fun! 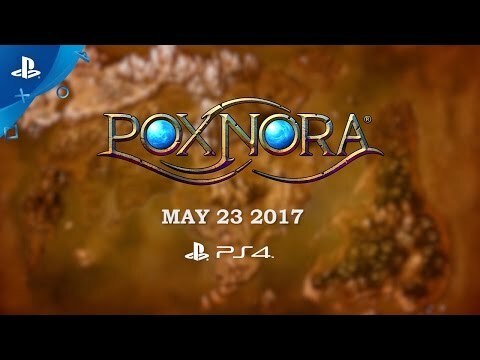 Pox Nora combines the magic of deck building and depth of strategic tactical combat in one package. Direct forces of over 2,700 runes (cards), apply over 4,000 abilities, and dive into over 35 ongoing stories. With 23 million games played, Pox Nora ensures the gamer experience comes first. Customize and fine-tune your deck. All kinds of themes and champions are available to you, from the tinkering Dwarves to the mutants of the Dunes to the psychic powered Jellebrium. Test your mettle online against players in 1v1 or 2v2 contests. Climb the leadership ladder to attain the rank of Battlemaster! Play against the AI in elaborate campaigns, featuring stories born in the beginning of Pox Nora. Earn rewards just by playing! Every game gives you opportunities to earn Gold, which can be used to unlock campaigns, decks, and even be redeemed for Booster packs. Ranked leagues offer rewards for each league achieved during the expansion cycle. Tournaments and limited-time campaigns give additional opportunities to earn even more content. Sacrifice existing runes (even ones you earn!) to craft the ones you want to complete your deck. Pox Nora - TM/ © 2014 Desert Owl Games. Developed by Desert Owl Games. All Rights Reserved.